Here is one such example, although most experts would argue not a good one. More about that later. We know there are electrons. Many, many electrons. They all have exactly the same quantum numbers, such as electric charge. In fact, nowadays phycisist go as far as saying they are all indistinguishable. This means if we perform an experiment with many electrons it’s impossible to say which electron is which at the end of the experiment. Another thing we know is that there is to every elementary particle an antiparticle with exactly the opposite quantum numbers. The antiparticle of the electron is the positron. What? To understand why a sane person would suggest something like this we need some background. The standard model describes interactions of fundamental particles with quantum field theory. The result of computations in quantum field theory are the same if we replace positrons with electrons that move backwards in time. just one particle, the electron, going forward and backward in time. So… do we agree that the second choice is not complete non-sense? Now we can understand John Wheeler’s answer to the two questions at the beginning of this post. 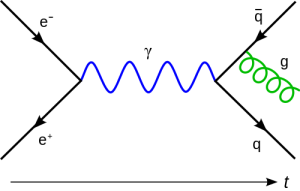 An electron moving forward and backward in time is enough for all interactions that involve electrons. For example, an electron can move backwards in time and come then back to the same point in time several times. Therfore all interacting electrons at one point in time may be one and the same electron. The famous electron-positron annihilation process is then nothing other than an electron that moves forward and then vanishes by moving backwards in time. The backwards moving electron is then what we call a positron. To summarize: All electrons are exactly the same, because they are all one and the same electron. This is possible, because electrons are able to move backwards in time. An electron moving backwards in time is a positron. Now for some “Woah Dude” read “The Egg” by Andy Weir and then come back and read the epilog. I’ll wait. So, where’s the catch? The one-electron theory is experimentally disfavoured. It would mean that there is exactly the same number of electrons and positrons in the universe. All observations show that there are almost only particles in the universe. If particles and antiparticles meet they annihilate, which results, for example, in photons. Thus if anywhere in the unvierse large amounts of antiparticles where present, we would see them. They would annihilate with ordinary particles and result in a distinct signal: large amounts of photons with energy equal to two times the particle mass, because of energy conservation. We don’t see such a singal anywhere and thus there is no reason to believe that there are antimatter galaxies somewhere in the universe. Maybe there is a catch to the catch. It turns out that we don’t know if antiparticles have the same massas particles or if they differ by a sign. In other words: we don’t know if antiparticles have negative mass. For normal particles the gravitational force is attractive, although the masses are the same. This is what causes the earth to revolve around the sun. The mass of the earth and the mass of the sun are positive and the gravitational force between them is attractive. This feature of gravity is in contrast to the other forces. For example, the electric force is attractive for opposite charges (+ and -) and repulsive for equal charges (+ and +). Negative mass for antiparticles is not a crackpot theory. There are arguments that if the Feynman-Stueckelberg interpretation is correct, antiparticles should have negative mass. Threre are several experiments at CERN that test this right now. They use an old collider to produce stable, neutral, atoms that consist only of antiparticles. Then they check if they fly up or down. Think about Newton and his apple. He observed that it falls down on earth because of gravity. An apple with negative mass would fly up instead. Such an experiment is not possible for a single antiparticle like a positron. The other forces are much stronger than the gravitational force and the effect of a negative mass is not visible for charged particles. This is the reason that we still don’t know if antiparticles have negative mass, although colliders like the LHC produce billions of them everyday. The standard point of view is that the masses of particles and antiparticles are the same. This is the result if you apply the mathematical charge conjugation operator on the mathematical object that we use to describe a particle. This computation yields the mathematical object that we use to describe antiparticles and all quantum numbers get flipped, except for the mass. Still, despite the Higgs mechanism, we don’t understand mass. We have no quantum theory of gravity. The standard model is not the end of the story. At a first glance it seems strange that all quantum numbers get flipped, except for mass – but who knows? In the end the experiments have to decide and I’m looking forward to the results of these experiments. A last comment: the matter-antimatter asymmetry is one of the biggest unsolved problems of modern physics. It’s not possible to explain with the standard model why there is only matter in the universe and not equal amounts of antimatter. …they share the same class, the same blueprint. Doesn’t mean they are the same object..
^ The point of the one-electron idea is to explain why all electrons are the same i.e. why they appear to belong to the same class – perhaps in a tongue in cheek way, this is done by saying that “they” are all in fact the very same particle. What I don’t understand about the one-electron view is that it seems not to account for virtual particles, i.e. particle-antiparticle pairs spontaneously appearing and annihilating. On the Feynman-Stueckelberg interpretation these would be closed loops, so couldn’t belong to the one particle zipping back and forth through time. So there would still be a multiplicity of electrons, and we would still have to explain why these all have the same quantum numbers.